digibet.com ofera un bonus de 100% pana la 20E pentru toti cei care se inregistreaza in aceasta perioada.In plus veti primi si un bonus de 5% din valoarea depozitului.Deci pentru 20E depusi veti primi 21E.Dupa depozit bonusul intra automat. Rulajul este foarte simplu, trebuie sa pariati o data depozitul+bonusul pe cota de 1,5. Se accepta depuneri prin:Moneybookers, Neteller, Card, Bank Transfer. Inainte de a retrage trebuie sa trimiteti o copie dupa buletin sau orice alt act care sa contina o poza. Retragerile se proceseaza foarte rapid, 12-24h. Opinie personala: Dupa ce va deschideti contul ar fi bine sa trimiteti un act de identitate.Se aproba in maxim 12-24 de ore.Astfel nu veti avea intarzieri la retragere. New customers at digibet.com get a 100% betting bonus, up to a maximum of 20 Euro! All new customers (registered after 03.08.2011 00:00am ) are eligible for a 100% betting bonus, up to a maximum of 20 Euro. In order to get the full 20 Euro sign-up bonus, a minimum deposit of 20 Euros is required. To request a withdrawal from the betting account, the customer has to wager the total amount of the deposit plus the bonus funds at least 1x (partial amount also possible) on one or more sports bet at digibet.com with minimum odds of 1.50. The customer has to wager the total amount of the deposit plus the bonus funds at least 1x (partial amount also possible) on one or more sports bet at digibet.com with minimum odds of 1.50. Should the customer wish to transfer the funds to the Casino or Skillgames, then the total amount (deposit + bonus) has to be staked a minimum of three times before a withdrawal is possible. 1. The bonus is granted to new customers who deposit a minimum of 5 Euro. Deposits less than 5 Euro, will not qualify for the offer. 2. The 100% bonus up to 20 Euro, will only be granted once per household, player, account, payment details and shared computer IP address. 3. In the case of already registered users, re-registering at digibet.com or multiple registrations are created; digibet reserves the right to cancel any bonus' granted and any profits resulting from said bonus'. 4.If digibet has reason to believe that a client registered more than one account, digibet may close those accounts and all bonus credited will be voided. Bonus promotions are available once to any person. digibet reserves the right to cancel any bonus promotion in the event of a client in breach or non-compliance with the promotion and/or standard terms. 5. Risk-free betting or casino-wagers will not be considered valid for the turnover requirements. 6. The 100% bonus up to 20 Euro applies to new customers who make a deposit after 03.08.2011. 7. digibet reserves the right to change the bonus promotion without prior notice or to terminate it prematurely. When you apply as a new customer, how is the bonus claimed? New customers, are all customers that have signed up after 03.08.2011 00:00am. All other players who have previously registered at digibet.com are considered existing customers and will not be valid for the sign-up bonus. How will the bonus funds be credited in my account? After making the initial deposit, the bonus will be credited to the account automatically. Under the menu option “Betting account / Statement”, you can view all entries and bookings. What should I do if I do not wish to receive the sign-up bonus? The bonus will be credited automatically to the account. If the customer does not wish to receive the bonus, an e-mail has to be sent to info@ digibet.com so that customer service can cancel the bonus funds. In addition, all general betting rules and terms and conditions for digibet Ltd. applies. Sa-nteleg ca dupa ce ai facut rulajul la sport, trebuie sa transferi banii la casino si sa ii rulezi si acolo de 3 ori ? Nu, dupa ce ai facut rulajul la sport poti sa retragi banii. A incercat cineva? e pe bune oferta? Depunerile prin moneybookers se iau in considerare pentru bonus ? Da, este pe bune oferta. Moneybookers este o metoda de depunere acceptata pentru primirea bonusului. Din cate am inteles , depui 20 mai primesti 20( un fel de free-bet) , deci daca pariez toti 40 pe 1.5 o sa am in cont tot 40 pentru ca cei 20 primiti dispar. Nu e mare afacere. Ai inteles gresit, depui 20euro primesti inca 20euro si singura conditie de rulare a banilor este : suma depusa + bonus 1x 1.50 (bonusul nu iti este luat dupa pariere). Eu am facut cont,este foarte buna oferta. Trebuie trimisa copie dupa buletin pentru verificare. virgulitza86 a explicat foarte bine daca mai era ceva de explicat.Acest bonus este practic aprope gratis. eu am citit altceva pe acolo , deci daca depun 20 mai primesc 20 pariez tot pe 1.5 si o sa am 60E pe care ii pot retrage ? LE: Sau poate nu, oferta la hochei pe gheata e aproape 0. "De ce il numesti" ai vrut sa spui, Lucian85 e singurul care l-a numit asa. Nu am deschis conturi la foarte multe case de pariuri online dar sincer sa fiu mi se pare cea mai usoara cerinta de rulare a bonusului. (e doar parerea mea). 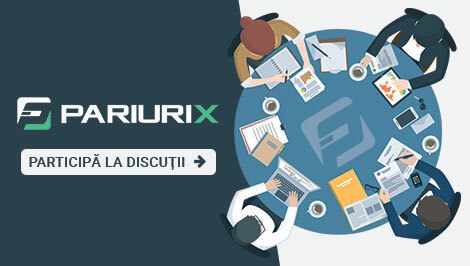 Oferta lor este slabuta la pariuri dar puteti profita de bonusul acesta. Eu unul am probat oferta si este pe bune, am depus 20euro am primit bonus 21 euro si am pariat toti banii pe o cota de 1.78 dupa care am retras. (inainte de a retrage am trimis copie dupa buletin) Retragerea a fost facuta prin transfer bancar vineri si azi am primit banii in cont. La depunere am intalnit sa zic asa o "problema" ,nu reuseam sa fac depunerea prin card, de fiecare data cand selectam cardul visa ma trimitea catre contul moneybookers. Sper ca ati inteles, selectez cardul visa, introduc suma pe care doresc sa o depun si apoi trebuie sa ma loghez la moneybookers ,iar dupa logare se efectueaza depunerea. este acolo mai jos credit card ( World Pay ) si depui acolo prin card. Da,am incercat o singura data prin credit card ( World Pay ) ,mi-a dat o eroare si nu am mai insistat. Tu ai reusit sa depui prin credit card ( World Pay )? 2 Se poate alcatui o cota de 1.50 din mai multe cote mai mici sau tu ai facut cota de 1.78 dintr-un singur meci si nu sti daca se poate asa ceva?